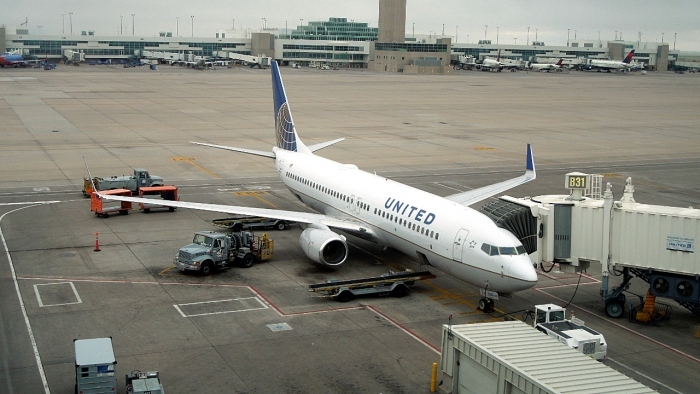 This past week United Continental Holdings, which is the holding company for United Airlines, announced, as part of their quarterly earnings release, that they would be focusing on improving connectivity at their Midwest or mid-continent hubs. United has Midwest hubs at Denver International Airport (FAA: DEN ICAO: KDEN), Chicago O’Hare International Airport (FAA: ORD ICAO: KORD), and Houston Bush Intercontinental Airport (FAA: IAH ICAO: KIAH). The company has “re-banked” Houston and will re-bank Chicago by February 2018. The re-banking strategy will allow for more connections at both hubs. The re-banking efforts are combined with an overall focus on improving hub quality with growth. This can be a good strategy as its Midwest hubs are in some good locations for connections. United’s focus on improving its mid-continent hubs can help the airline significantly as hubs play very important role in an airline’s operation. Above United Airlines Boeing 737-800 at Denver International Airport photo by DReifGalaxyM31 on Wikimedia Commons. Photo enhanced by FlyRadius and released under a Creative Commons License. Hubs are an important part of most airlines around the world. In the United States, most airlines operate with some type of a hub network. The “big three”, Delta, United, and American, all have hub networks and have had hubs for along time. JetBlue and Alaska both operate a hub system, for the most part. Frontier and Spirit also have hubs within their network. Southwest operates an interesting focus city system that is like a hub system. Allegiant Air focuses on point to point destinations, however, they have many focus cities. Airlines that offer connections can maximize their network and offer more options to their customers. Many customers, however, prefer direct flights, which are possible to many destinations. Direct flights can be good for customers, are easier to operate and can potentially reduce costs, however, connections and hubs offer more options and can maximize the amount of seats filled. People want to travel to many different places. A person flying from San Francisco may want to fly to New York, Orlando, or to Kalispell, Montana. Direct flights are possible to destinations like New York because there is enough demand for direct flights to that city. San Francisco to Orlando also has direct flights, however, there are fewer direct flights in comparison to New York. In fact, a connecting flight may actually be one of the main options to travel from San Francisco to Orlando. San Francisco to Kalispell has no direct flights due to the fact there is not as much demand in comparison to New York and Orlando. Instead of having no options to go to Kalispell, travelers flying from San Francisco have the option of taking a flight to a hub and then board a plane to Kalispell. At the hub passengers from Atlanta, Orlando, and New York also board the plane to Kalispell. With the hub and connection flight an airline can allow all customers wanting to go to Kalispell to meet at a central location and then board a plane to Montana. This allows an airline to fill more seats and use its aircraft more efficiently. A hub allows customers to connect to multiple cities and regions of the country, which makes a hub the most important part of the network. A hub located in the right place will allow for efficient connections. A hub in the right location can avoid major weather problems, which is key to minimize operational delays and problems. A delay at the hub or en-route to the hub can severely affect a traveler’s itinerary. Because a hub acts as a stopping point, it should be very customer friendly and offer multiple amenities. If a hub acts as a travel destination in itself, additional customer needs and opportunities can be meet. The size of a hub also needs to be taken into consideration. The amount of gates, the time needed to move from one flight to the next, and the number of flights that can be operated each hour are all important areas that need to be looked at closely. The best way an airline can ensure that its hub can offer customers an outstanding experience is to buy one. An airline needs to own their own hub to offer the best service to its customers. We are unaware of any airline that has actually owned their own hub or airport. A critical portion of an airline’s operations should be under their own control. When an airline has a hub in their portfolio, they can shape the hub to meet their operational profile and enhance the customer experience. If United or any airline wanted to greatly improve their operations and open up new opportunities, they should consider building their own airport and hub. Building a hub from the ground up will allow for creativity and innovation to excel in building the ideal hub for all travelers.